A porphyritic texture displays minerals in two distinct size populations: one or more minerals are consistently larger than the rest of the minerals in a rock. The extra large mineral grains are called phenocrysts. Feldspars, augite, and hornblende commonly show rectangular crystal shapes, whereas quartz and olivine generally occur as fairly rounded blobs. The rest of the smaller mineral grains are called the groundmass. Porphyritic textures are found in rocks with both coarse- and fine-grained groundmasses. Because larger grains generally indicate longer cooling rates, the phenocrysts indicate that the magma experienced an initial phase of slow cooling deep underground. In rocks with coarse-grained groundmasses, the phase of slow cooling was followed by a phase of faster underground cooling. This could happen if the magma migrates to shallower, cooler rocks or if a volcanic eruption taps off some magma from the chamber. 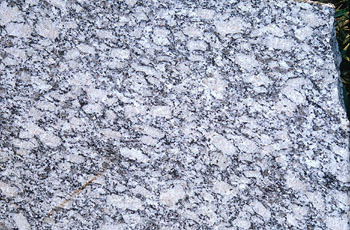 This granite has large light gray K-feldspars set against a groundmass of smaller equigranular quartz, plagioclase, and hornblende grains. The roughly horizontal orientation of the K-spar crystals suggests that they settled out from the liquid magma. 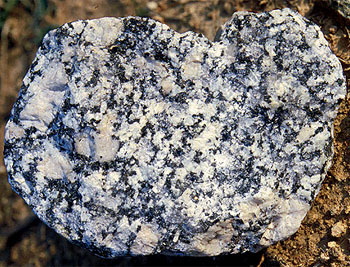 This 6" sample of granite shows large pinkish K-feldspars set against a phaneritic matrix of quartz, plagioclase, and biotite. Quartz is hard to spot in this photo. It occurs as small grey blobs.